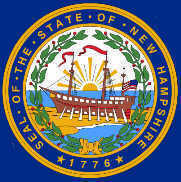 The New Hampshire state seal identifies government buildings and officials and is a centerpiece for the New Hampshire state flag. 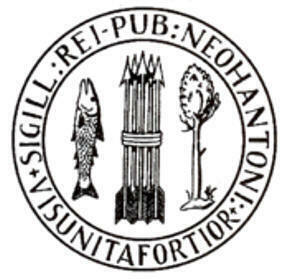 The symbolism, history and emblems of the New Hampshire seal are described in this article. The 2 five-pointed stars separates the beginning and end of the New Hampshire inscription and is a symbol of the unity of all things and the essence of the life force. A broadside view of the 32 gun frigate Raleigh, flying a depiction of the flag of the United States, dominates the picture designed in 1931 and is the centerpiece of the seal. When Legislature revised the seal it directed that the image should 'depict a ship on stocks'. The term 'on the stocks' was once used to describe an item under construction, as especially a ship. USS Raleigh was the first of the 13 ships that the Continental Congress authorized for the United States Navy in 1775. The Raleigh was the first ship to carry the American flag into sea battle. The fate of the Raleigh was that she was beached off the coast of Maine, captured by the British and used for the remainder of the Revolutionary War against her own country. 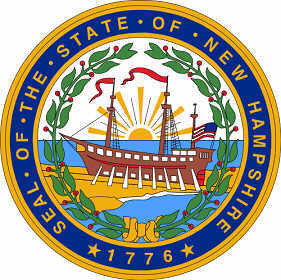 The New Hampshire seal is kept and used as required by the Constitution and laws of the state. There is an inaccuracy on the seal, and subsequently the state flag, due to the modernised impression of the state flag and seal. The large gray granite rock or boulder has disappeared - the official state nickname is "the Granite State". The official description of the seal (directed by 1931 Legislature) in the New Hampshire Statutes, Section 3:9 which details the description of the seal states "...a granite boulder on the dexter side...". Dexter is a term used in heraldry to refer to a specific location on a crest. "Dexter" means to the left of that of the viewer. According to the New Hampshire website there were previous inaccuracies. The 1931 Legislature were so concerned that the details on the 1784 seal had become so distorted that they voted for major improvements, and, for the first time, defined its exact description. Apparently, the director of the New Hampshire Historical Society, Otis G. Hammond, sparked this adjustment, by reporting that artists and sketchers had injected surprising details into the seal, as they produced new dies every few years for official state use. Evidently rum barrels had been depicted on the dock and occasionally human figures were depicted beside them. Governor John G. Winant formed a committee to serve with Otis Hammond, to produce a less objectionable seal. The 1931 Legislature readily approved its recommendations. Over 80 years later we find that history is repeating itself. This is the 1876 design of the seal shown on an old state flyer and shows the frigate under construction. The pictures on either side represent early inhabitants of New Hampshire. An American Native Indian is depicted fishing using a spear. The other picture shows an early settler also fishing, but using a fishing rod. Fishing and forest products were the backbone of early industry in New Hampshire and a waterwheel is featured in the background. New Hampshire Official Nickname "Granite State"